A video flyover of the future development at Point Wells. 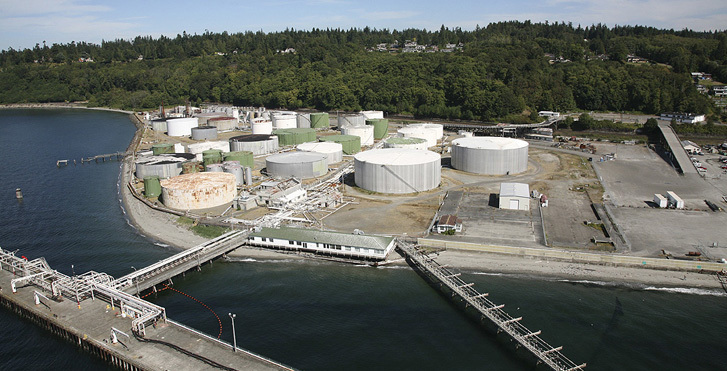 Snohomish County— The visionary behind the proposed mixed-use community at Point Wells said an April 10 ruling by the Washington Supreme Court represents a new catalyst for the transformation of the aging industrial site on Puget Sound near Seattle. Point Wells is a dramatic setting, with a two-thirds of a mile stretch of beach and vistas of Puget Sound and the Olympic mountains. 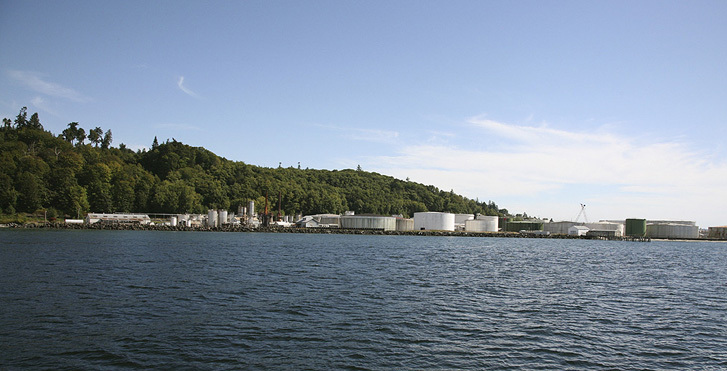 The transformation from a century-old petroleum products facility into a showcase urban center requires a long-range vision for development over a 10 to 20 year period– a place where residents and neighbors will share what Nature has provided on the shores of Puget Sound. A New Vision for Living. Now shut off to surrounding communities due to federal security restrictions, the 61-acre site would become an exceptional mixed-use community with public access and new public amenities, restored habitats, sustainability features and a wide range of transportation options. The first stage of bringing the vision to life has begun. 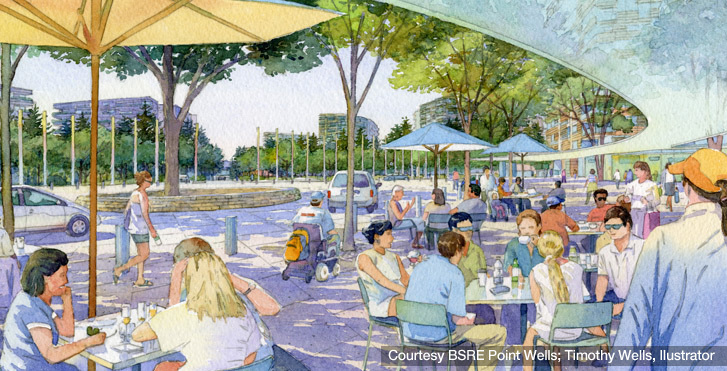 Developer BSRE Point Wells, LP is working with the internationally recognized architecture firm of Perkins+Will to prepare initial community design elements for sharing and discussion with the community. And development management and representatives continue to meet with elected officials, staff and local residents to discuss how the development will be integrated into surrounding communities. 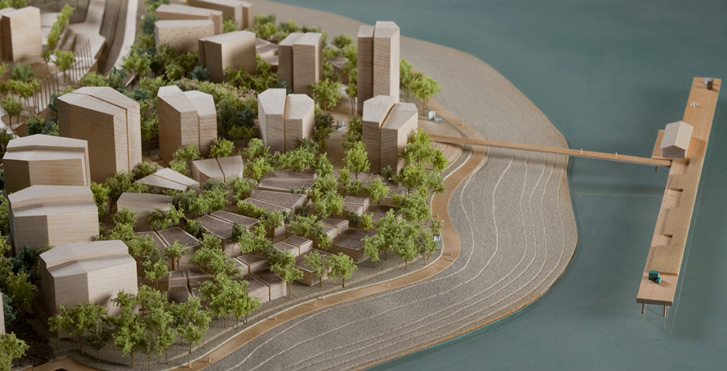 The project team, including the noted landscape design firm Peter Walker and Partners, is considering a wide range of potential design features to complement the site’s unique shoreside environment. 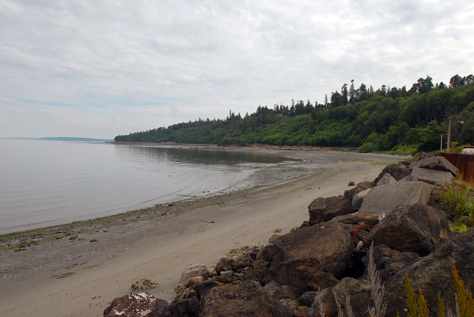 Following a multi-phase clean-up process, preliminary plans include a restored beachfront (and enhanced salmon habitat), re-introduction of forested conditions to the site’s open space and daylighting a natural stream. 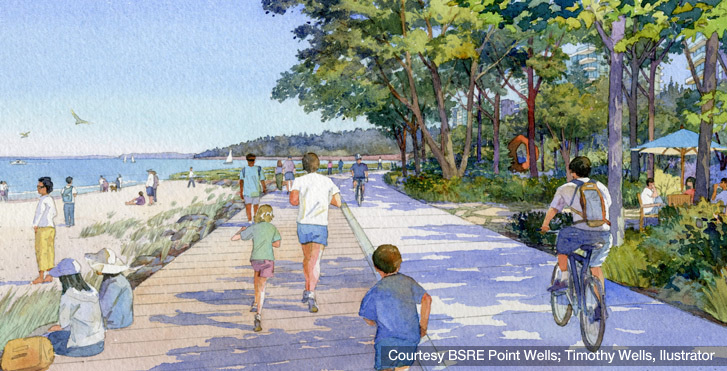 Public access to the sandy beachfront, existing pier and newly-created amenities-including bicycle and pedestrian pathways-will be part of the concepts. Sustainable features that may be incorporated include new heating technologies to supplement standard methods, reduction of typical water use, graywater re-use and other “green” elements. 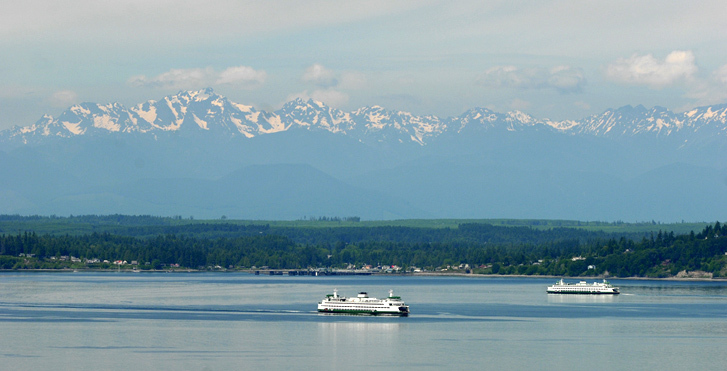 To minimize automobile use to and from the site, the new community at Point Wells would be built around multiple transportation options, ranging from bicycles, van pools, car sharing programs, and mass transit-including a bus turnaround and a potential Sound Transit commuter rail station at the site. To be refined and defined, these are the elements for a new vision at Point Wells to be explored and shared in the months ahead. © BSRE Point Wells, LP. All Rights Reserved.